I’ve been to Fushimi Inari a few times, most recently in May 2008. It’s just south of Kyoto. 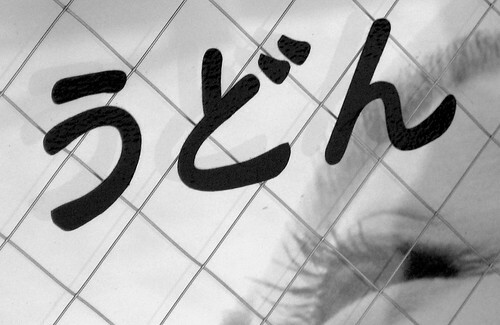 A wonderland of Japanese iconography. On the way up Mt. Inari. 2003. Several years ago I was introduced to Judith Clancy, a long time resident of Kyoto and author of the best walking guide for Kyoto I know of: Exploring Kyoto. The front of both Judith’s first and second editions of Exploring Kyoto feature photographs taken at Fushimi Inari. This ancient Shinto shrine complex is so vast — spread out at the base and winding its way up the side of a mountain — that there’s no way (other than by way of a satellite, I suppose) that one could take a photograph of Fushimi Inari. One has to, one gets to, take it all in in doses — after every corner one turns a usually subtle, sometimes eye-popping, surprise reveals itself. “Founded in 711, the shrine was given imperial rank after it became associated with Kukai, founder of Shingon Buddhism in Japan and the great temple Toji. The wood used to build Toji was taken from Mt. Inari, the peak behind the shrine. . . Local businesses incorporate the symbols of Fushimi Inari Shrine into their decorative motifs. . . You will also notice the many pairs of white fox statues adorning shops and stations in the area. One fox holds a sacred jewel in its mouth that represents the spirit of the gods, while the other holds a cylindrical object that represents the key to the rice storehouse. Foxes, especially the rare white ones, have long been associated with Inari [the Shinto rice god], and various legends account for this. . . For serious devotees, however, visiting Fushimi Inari means [enjoying and paying respects at the main shrine buildings at the mountain’s base], then hiking up the mountain and doing the same at every subshrine. . .
“The path up begins at the stone stairs you see as you face the mountain. Take the path on the right. A long row of red votive torii forms a tunnel of stunning simplicity. . . The torii at the bottom of the hill are more massive than those farther up. You might even see a crew of workmen replacing a deteriorated torii. A thin piece of wood bearing the name of the donor of the new torii is inserted in the spot where the old gate had stood and will remain there until the new torii has been completed: thereafter the patron’s name or that of his or her business will be painted in black on the new gate . 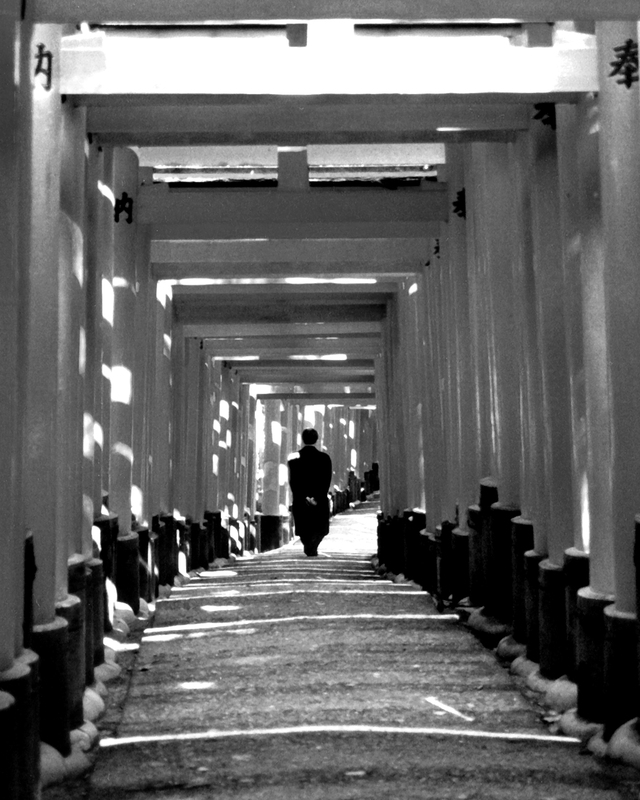 . . .” From Judith Clancy’s Exploring Kyoto: On Foot in the Ancient Capital. In producing following photographs — all except the last one taken during my last visit to Fushimi Inari in May 2008 — I try to give the viewer a sense of the dreamy, “Alice in Wonderland” feeling that can envelop those visiting, strolling around, hiking through its torii tunnels and along its steep, verdant paths. If you ever want to see it with your own eyes, just ask me and I’ll be happy to get you there. Several dozen of the more than 10,000 "Torii" (sacred gates) at Fushimi Inari. Students read look for a place to hang up their "ema": small, wooden placques upon which they've written their wishes or prayers. Note these are fox-shaped. Wall along the way up Mt. Inari. Inside one of a few small, rustic restaurants situated along the path up Mt. Inari. A couple of the many sacred foxes and 100s of small torii at the Shrine atop Mt. Inari. Along the descending path. . .
Workman putting last touches on a newly-restored torii. Silhouettes along the Fushimi Inari path. This is not a black & white photo. Building detail, Fushimi Inari Shrine. Foot of Mt. Inari. Lantern detail. At the main shrine complex at the base of Mt. Inari. Man alone. Fushimi Inari. 2003. And let’s not forget inarizushi, as the god Inari had an apparent fondness for fried tofu. Yeh, what’s with that? My host father, from back in the day (college) actually turned my mind and soul around regarding tofu. Tofu is Japanese grits: in and of itself, not so special. But as a conduit for all kinds of savory things, unbeatable. If the big brains over at Cern ever supercollide tofu and grits at close-to-light-speed, I can only image the worlds of Ultimate Goodness that will be set free in the universe, or will bring about our Doom. Whichever.